Situated in tree-lined surrounds, within walking distance of the city centre, these spacious studios include free Wi-Fi and satellite TV with more than 50 channels in every room . 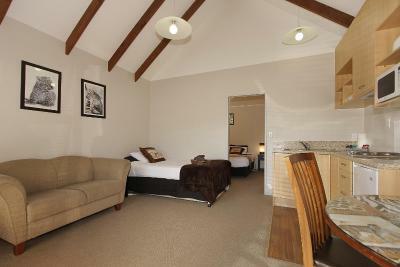 B-Ks Motor Lodge offers 5-star, self-catering accommodation in the heart of Palmerston North. Restaurants, shopping and the iconic “Square” are just a 5-minute walk away. Rooms are modern and feature free Wi-Fi. Located just 5 minutes' walk from off Palmerston North’s restaurants and pubs, Big Five Motel offers modern studios and apartments featuring HD LCD TVs and animal themed décor. Kiwi Studios Motel is located in the heart of Palmerston North, a 10-minute walk from the Te Manawa Museum. It offers self-contained accommodation offering a flat-screen TV with satellite channels. Situated along Palmerston’s main thoroughfare, Bellavista offers pleasant studios, a business centre and free parking. It is a 5-minute walk from the city centre’s dining options and Lido Swimming Complex. 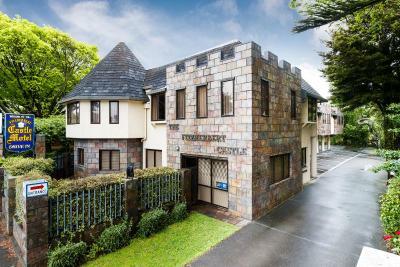 Just 10 minutes’ walk from Te Manawa Museum, Aubyn Court Spa Motel offers self-contained accommodation with a private spa bath and flat-screen TV with 50+ satellite channels. Guests have access to free WiFi, a sauna and fitness centre. Less than a 10-minute walk from The Square, Cornwall Motor Lodge offers self-catering rooms in Palmerston North’s city centre. Guests enjoy over 50 satellite channels, daily newspapers and free parking. Guests enjoy unlimited free WiFi each day. City Corporate Inn offers elegant self-catering units with double spa baths and large flat-screen TVs. Offering free parking, it is less than a 5-minute drive from Palmerston North’s city centre. Braemar Motor Lodge offers self-catering accommodation just 300 metres from the shops and restaurants in Palmerston North city centre. All rooms include satellite TV and cooking facilities.